Use my custom designed Animal Kingdom Character Location Map to find your favorite characters. To access FULL character schedules and interaction tips designed for mobile access, subscribe to Character Locator! I also heard rumors of Baloo, King Louie, and Flik leaving the park. I hope those rumors aren’t true. I think they should get rid of Doc Mcstuffins and put the Zootopia characters (Judy and Nick) in her spot instead. We don’t need two meet and greets for Doc Mcstuffins. I think one is enough. I wish Disney World would be like Disneyland though. There are more characters there but sadly California is too far away from where I live. We met and took our own pictures with Braer Fox and Thumper just outside AK the other night. Didn’t know if you knew about these characters being here. It was around four p.m.. They sometimes pop up in the afternoons. Just FYI, Tarzan and DiVine do not have a photopass photographer with them. was just on my Disney experience and Rafiki his not listed on the site do you know why? thank you I asked a question about a week ago and can’t find it on your site now but looking at hollywood studios it is showing olaf, buzz and woody and mickey and minnie are only meeting mondays and wed starting the week of Aug 8 is this too a mistake? Where do you see such? Hi Kenny, does Pocahontas start at 9:00am or 9:45am? You have one time, My Experience app has another. We going next Monday. Thanks so much! Hi, Kenny. I notice that Baloo & King Louie are not on the AK calendar after 6/25/16. Have you heard anything about that meet going away? No, but a lot of stuff is missing on Animal Kingdom schedule for next week right now. Probably just oversite, but we’ll see. Hi Kenny! Any chance on meeting Turk, from Tarzan? Does Rafiki meet outside the gates *before* park opening? Or is he there once the park opens before he has to hightail it to Planet Watch? So approximately how long is Rafiki hanging out near the entrance before leaving for Planet Watch? I’ve been finding out that Meeko has been meeting a lot recently in Pocahontas’s location. Do you think he might be a new regular meet or does he just make surprise meets with her? He might even replace Pocahontas when she is not available. Why doesn’t tarzN meet anymore. And do you know if he will come back? Does Jiminy Cricket not have meets anymore? Hasn’t for a long time. Where is Pocohantas’s new meet and greet? Can you fast pass this? Ratcliffe and Meeko are random pop up meets that don’t happen every day. Great finds. How long was the wait to meet her? Depends upon what day and time you go. I am looking at the character list and I see that Jiminy Cricket is off the list. Does he still meet regularly or is he gone? So about how long does she hang out at each slot? For 11 am one is it 11-11:30? 11-11:50? Or do two dif Pocas trade on and off in 30 min increments all day? does tarzan not come out anymore? Do any of the characters dress in Christmas attire around the holidays? If so, which ones? Thanks! We want to meet Pocahontas for our stay at WDW The first week of October. The app shows Pocahontas won’t be at AK past the date of Sept 27? Does she go away in fall and winter ? It’s actually that way with several characters gone past Sept 27 . Do you know if this is true or just a glitch in the my disney experience app? 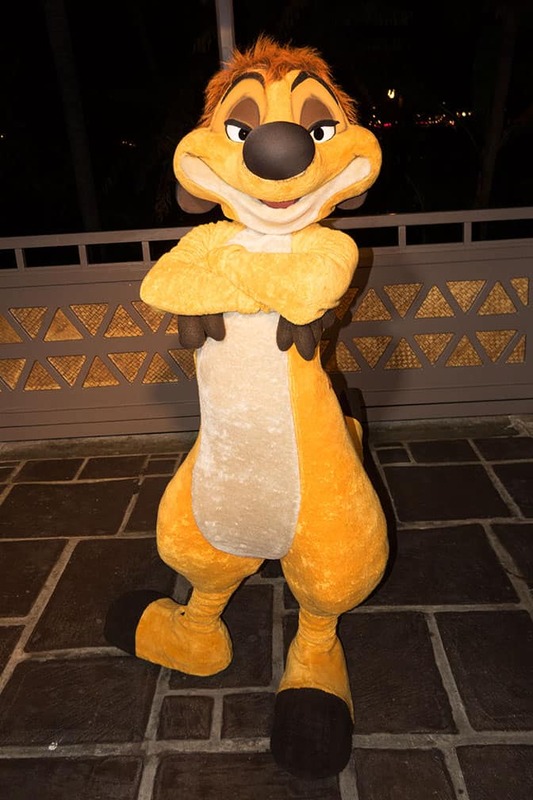 Dino Dance Party report for Sunday 6/22/14: Six total characters – Brer Bear, Brer Rabbit, Thumper, Rafiki, Chip, Dale. No Mushu. That was kind of a dead dance party line up there. Brer Rabbit and Thumper are kinda cool though. Karan, I can’t predict the future for schedules, but it’s posted for the next few weeks that way. Do any characters meet during Extra Morning Magic Hours? No. If they did, there would be a note next to the first time. How about Divine? Is there a schedule at all for her or just random appearances? Hey Kenny. Question. Can you still find characters such as Brer Rabbit, Tarzan, etc. at the oasis in the morning? Any chance you can find timon at the parks? Pretty slim. might get lucky at the Dinoland Dance Party. what characters were cut along with flik? why did camp Minnie mickey close? hello! congratulations for your page! I love it and I find it very useful! thanks for all the information. Go to September 2014, we know if keychain dug and removed russel or short term? Another question russel dug not sign? Why? and chip and dale either? International disney if signed. Those characters all sign. Dug and Russell will still be around. Do you know where the characters from Camp Minnie/Mickey will move to after it closes? We go Jan 16 and am trying to plan character meets! 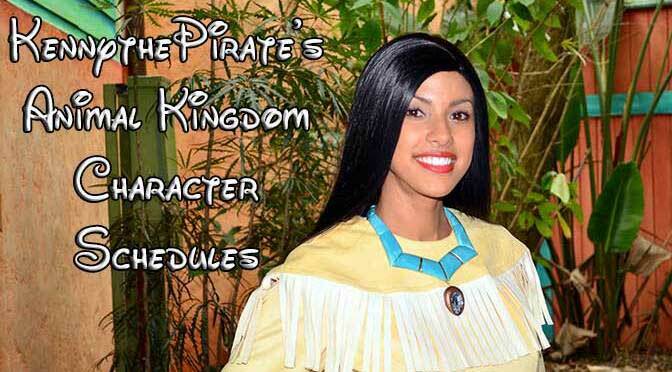 if festival of the lion king and camp Minnie Mickey are closing on January 6, 2014, will there still be a place for a meet and greet with Pocahontas? if so, where would it be? Is thumper located anywhere? What about dumbo? Bo peep? Or the prospector? We drove all the way here from Boston and haven’t seen anybody really that we wanted too. Thumper was retired, Bo Peep used to be in parade only, but that was cut. Prospector has never been a character. If they aren’t on my lists, they don’t exist. They might return after I finish merging the blog into the new database. Do Bre’r Bear or Bre’r Rabbit meet in Camp Minnie Mickey? Ok thanks I’ll be sure to check that out. If AK closes at 5pm, when is the latest we could board the train to conservation station and still meet Rafiki? Looking at both this page of times and the characterlocator.com page you have. Question about times. You say on this pages 20 minutes til close for example. 20 minutes until close of the park? So does this mean if the park stays open to 8 p.m., the character meets until 7:40 p.m. If so, then the two sites don’t match. Just wondering which is correct? Just doing some cross-referencing, so wondering if the times above are still valid or if I should be depending more on the characterlocator.com page. I resolved the conflicts for the week. Thank you! I was hoping for later times then the characterlocator site was showing. Again just have to say amazing site. Thank you for taking the time to create and maintain the sites. You’re welcome. I’m working to blend the three data bases into one after vacation. Will reduce errors. On your CL app it says Darkwing makes rare appearances here. Does it still happen? He is most likely to appear for RunDisney events like the annual WDW Marathon. Appearances in the parks are extremely uncommon. So does that mean he’s rare still? Just wanted to make sure with all the changes happening at AK – are Baloo/King Louie and Dug/Russell still at the same place/time as noted above? Where is Bradley Falls? Could you give me a ‘landmark’ so I can find Pocahontas easily? Thank you so much for your awesome guide! I’m so glad Dug and Russell will be there. Now all I need is Bolar hat guy and I will be up to date on all the Pixar characters. Unless Disney does something very out of the ordinary, the Bowler Hat Guy won’t be seen any time soon. Bowler Hat Guy is not Pixar. Meet the Robinson’s is Disney Animation Studios, although it was the first DAS movie that John Lasseter was a part of after being made Creative Director. We were there in 2011, I do not remember all of these Meet & Greets listed, Do they not list all of them? We are going the last week in Febuary. Disney doesn’t provide all their meet and greets, just some. Does Flik still do meet and greets? If you like Flik, and wish he had never been cut. Just stop at Guest Relations at Animal Kingdom and tell them that your upset that Flik is not doing meet and greets. It’s the only way. No, Meeko doesn’t make regular meets any longer, just surprise ones.